Not all wrist and hand fractures are the same. It is important that you listen to the advice that the medical staff give you. After removal of plaster you may notice that your wrist and fingers have reduced strength and movement, the skin on your hand and fingers is dry and scaly, and your wrist may ache. If your forearm is dry and flaky, wash your hand and forearm in warm soapy water and then apply hand cream. If you are given a crepe bandage, this should only be for short-term use (the first few days). Remove for exercise sessions and at night. Even though your wrist and hand may feel weak and painful, it is important that you use your hand as much as possible for everyday activities, within reason. To start with you will have difficulty lifting heavy objects, such as a pot of potatoes, but by gradually increasing how much you use your hand, your hand strength will improve. Short, frequent use to start with is the best. If you have a lot of discomfort after activities, a soak in warm water may help ease this. 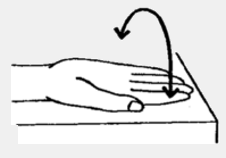 These are exercises that will help increase the range of movement of your wrist and hand, and therefore your function. Do each exercise at least 20 times with a rest in between. repeat two to three times a day sitting at a table. Written by Orthopaedic Outpatients and Physiotherapy Departments, Canterbury DHB. Adapted by HealthInfo clinical advisers. Last reviewed February 2017.